Today is the feast of Pope St Damasus I, who elected in October of 366, at roughly the age of 60, and died on this day in 384. His family was of Spanish descent, but he himself was born in Rome, and served as deacon at the church of St Lawrence Outside-the-Walls. He was elected to the papacy in the midst of controversy, since a small group of the clergy supported another candidate, Ursicinus; the followers of this schism seized control of the Liberian Basilica (now St Mary Major), and could only be repressed with violence, and the exile of the anti-Pope. St Damasus was a strenuous defender of the orthodox Christian faith, holding synods in Rome to condemn the heresies of Macedonius and Apollinaris, sending legates to the First Council of Constantinople, and excommunicating the Arian bishop of Milan, Auxentius, who was later succeeded by St Ambrose. It was at his behest that St Jerome revised the Latin text of the Gospels, and it is in a letter to him that Jerome famously describes the need for such a revision by saying, “There are as many versions (of the Bible) as there are copies.” St Jerome is traditionally represented as a cardinal because of the time he spent in Rome as Damasus’ secretary. 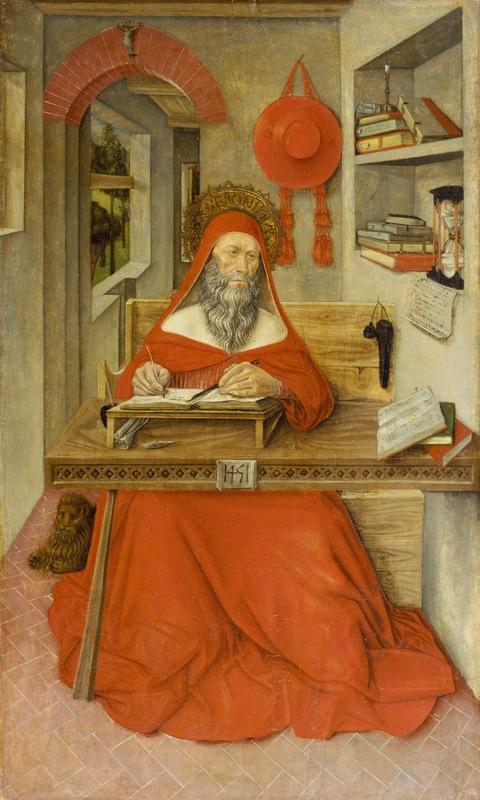 St Jerome in His Study, Antonio da Fabriano, 1451. Pope Damasus is today venerated also as the patron Saint of archeologists, and particularly those who work in the field of early Christian archeology, because of his great encouragement of devotion to the Roman martyrs, and his efforts to preserve their memories. 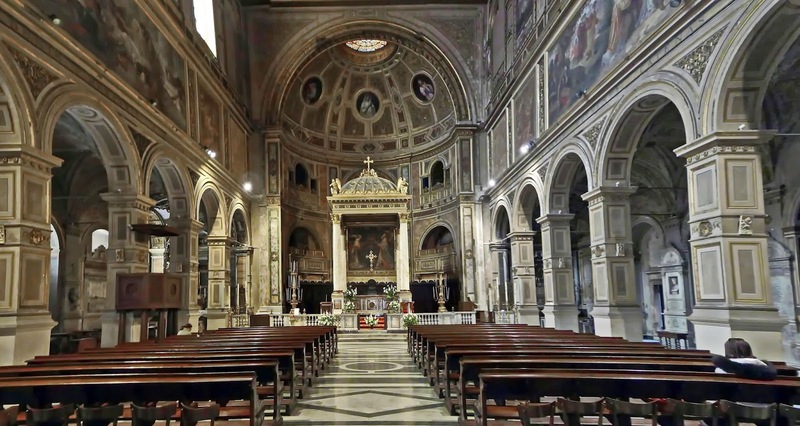 He built a church in honor of St Lawrence within his own house in the center of Rome, now known as “San Lorenzo in Damaso”, and also a shrine at the Catacomb of St Sebastian, where the bodies of Ss Peter and Paul were once kept, and the baptistery of the ancient basilica of St Peter. Within many of the Roman catacombs, he had the areas around the martyrs’ graves reworked to make them easier for pilgrims to find and more accessible. He also decorated the graves of many martyrs with epitaphs, composed by himself, and carved into marble with a special kind of lettering invented for the purpose. This font, in which the bars of the letters are alternately thick and thin, with curves serifs at the corners, is known as either “Philocalian” lettering from its inventor, a friend of his named Furius Dionysius Filocalus, or “Damasian” after himself. We have a total of about 70 of these inscriptions; about 40 of the originals are preserved, while the rest are recorded in various sources, although the stones themselves have been lost. One of the best preserved of these is at the church of St Agnes Outside-the-Walls on the Via Nomentana, the high altar of which sits over her gravesite. As seen in the photograph below, only the upper left corner is missing. After recounting the martyrdom and burial of St Agnes, (including the story that when her clothes were torn off, her hair miraculously grew to cover her) the final line asks the “renowned martyr to favor the prayers of Damasus”. These inscriptions are particularly valuable witnesses to the authenticity of various martyrs, and the liturgical devotion paid to them, since we know that Pope Damasus took care to inform himself about the martyrdoms as best he could. At the grave of Ss Peter and Marcellinus, who were killed in the persecution of Diocletian in 304 A.D., he placed an epitaph in which he gives the story of their death, and then notes that he learned the details when he was a boy by interviewing the martyrs’ own executioner. Being himself born in the very heart of the persecution, and therefore a young cleric in Rome in the early years of the peace of the Church, he must also have known people who had witnessed the martyrdoms of Ss Agnes, John and Paul, and Sebastian, just to name a few.